1164. 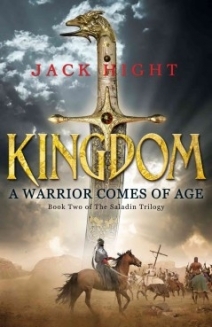 The young warrior Saladin joins a Saracen army headed for Egypt. There, he is surrounded by enemies and haunted by a secret that threatens to destroy him. Meanwhile, in Jerusalem, Saladin’s closest friend, the former crusader John of Tatewic, has been branded traitor. Spared execution on condition that he serve King Amalric, he soon finds himself embroiled in court intrigue. Dark forces within Jerusalem conspire to seize the throne. As John confronts them, his loyalty to Amalric, and to his old friend Saladin, is put to the test. And so begins the battle for Egypt and for the Holy Land, a conflict that will rage from the dunes of the Sahara to the walls of Alexandria, from the mountaintop citadel of the deadly Hashashin to the plain of Montgisard, only miles from Jerusalem. The battle lines are drawn, and this time, Saladin and John will meet as enemies.